Oh no! Rob and Kristen reportedly had a huge fight on his birthday, May 13. Are they heading for a split? Kristen Stewart and Robert Pattinson have certainly had their fair share of ups and downs throughout their relationship — most notably with K-Stew’s cheating scandal in July 2012 — but after the Twilight actress was spotted looking very glum on Rob’s birthday, May 13, we’re a bit nervous the twosome may be heading for splitsville! 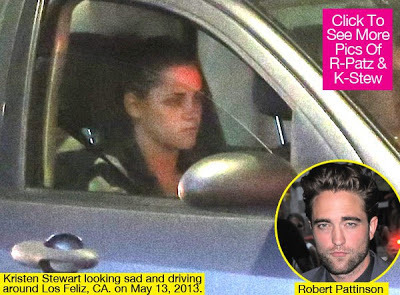 Kristen, 23, was spotted at a friends house on the afternoon of May 13, arguing on the phone. According to a report by X17 Online, it appeared as though K-Stew and Rob, 27, were breaking up. “Kristen was pacing back-and-forth in her friend’s apartment, smoking. She looked really upset, talking on the phone for almost an hour — I’m guessing she was talking to Rob. She was really animated, like she was trying to explain something. She was getting frustrated and seemed very emotional,” a photographer tells X17 Online. After ending the heated phone conversation, Kristen and her friend drove to another friend’s house, where they ended up talking in the car for almost 45 minutes.